Baba Amarnath ji is a sacred Hindu pilgrimage shrine.This is a rare old picture of baba Amarnath ji. Amarnath is 145 km east of Srinagar in Kashmir. There is an ice Silva-linga here that changes size with the seasons, and also as the moon waxes and wanes it becomes bigger and smaller. On the full moon day the linga is about 6 ft high. Each year on the full moon day of July-August (Sravana) when the Siva-linga attains its maximum height there is a festival at this cave temple. It is said that Lord Siva first appeared on this day. It is located in a glacial valley at 4,175m (13,700 ft.). The cave is about 150 feet high and 90 feet long. Within the cave there are four or five ice formations that resemble the figures of different gods. The biggest figures of different gods. The biggest figure is regarded as Siva (Amarnath). On the left side of the linga is an ice formation called Ganesh, and on the right side is one of Parvati and Bhairava. The area is covered with snow from September to June. The cave opens only in July and August. This is the rainy season, so pilgrims have to brave the rain to get there. About 25,000 people make this pilgrimage each year. You can also hire ponies and dandies for the trip. It is very crowded during the annual Sravana festival. There is a yearly pilgrimage starting from Srinagar that is led by the Chhari Saheb, the holy seepter. The most important event during June, July & August, is Amarnath Yatra to the Holy Pilgrimage. This is an annual event when thousands of Hindus from different corners of the Globe visit Amarnath caves. The pilgrims trek from Pahalgam to these caves and worship the great ice Lingam. Legend has it that Shiva recounted to Parvati the secret of creation in a cave in Amarnath. Unknow to them, a pair of mating doves eavesdropped on this conversation and having learned the secret, are reborn again and again, and have made the cave their eternal abode. Many pilgrims report seeing the doves-pair when they trek the arduous route to pay obeisance before the ice-lingam (the phallic symbol of Shiva). This is an event you certainly will talk about for the rest of your life. There is famous Rigvedic Verse that says "Ekam Sat" that is "There is one Being ,the sages call Him by many names." The God (Parmeshwar) has three deities who carry on the world. This is Known as Holy Trinity. Brahma- the creator, Vishnu - the perpetuator of life and Shiva (Mahesh) - the purifier and perpetuator of good and destroyer of evil. Rig Veda refer Shiva as Rudra as in its following verse. "We Worship Tryambaka (Rudra), Who spread Fragrance and Increases Nourishment, May He release me, like the cucumber from its stem, From Mortal Life, But not From Immorality. According to the verse Satyam, Shivam, Sundaram, the life is described as having three facets Truth (Satyam), Good (Shivam) and the Beautiful (Sundaram). Shiva is a living God. The most Sacred and ancient books of India, the Rig Veda narrates His presence in the hymns. Vedic myths, rituals and even astronomy testifies to His existence from the dawn of time. The Mohindaro and Harapa findings confirm Shiva worship in the ancient India. According to the older scriptures, He has three places of His residence. One is Kailash Parvat another is Lohit Giri under which Brahamputra flows and third is Muzwan Parvat. The story narrated by people about the discovery of this Holy Cave is of a Gujjar ( shepherd) Buta Malik . He is given the credit of discovering this Holy Cave . Story goes like this , that a saint gave Buta Malik a bag full of Coal. On reaching his home when he opened the bag , to his utter surprise the bag was full of gold coins . This made him overwhelmed with joy. He ran to thank the Saint . But, what he found was that the Saint had disappeared . Instead , he found The Holy Cave and Shiv Lingam there in . He announced the discovery of this to the Villagers. Then onwards this has become the sacred place of Pilgrimage . The ancient epics narrate an other story which goes like this. The valley of Kashmir was under water .It was a big lake. Kashyap Rishi drained the water through number of rivers and rivulets . In those days Bhrigu Rishi came that way on a visit to The Himalyas. He was the first to have Darshans of this Holy Cave . When people heard of the Lingam, Amarnath for them became Shiva's abode and a Centre of pilgrimage . Since then Lacs of devotees perform the pilgrimage through tough terrain and avail eternal happiness. 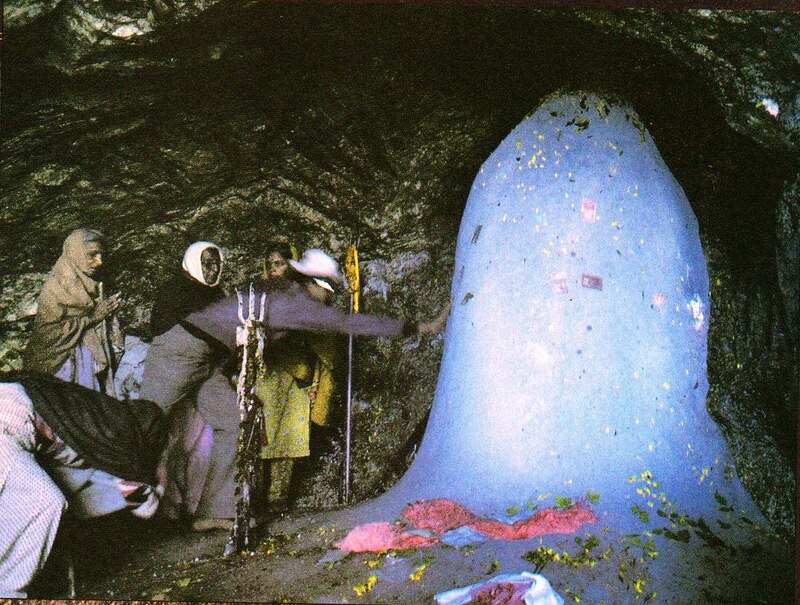 The trek to Amarnath, in the month of sharavan ( July-August) has the devout flock to this incredible shrine, where the image of Shiva, in the form of a Lingam, is formed naturally of an Ice Stalagmite, which waxes and wanes with the Moon's cycle . By its side are fascinating, two more Ice Lingams, that of Maa Parvati and of their son, Ganesha . The Amarnath Yatra is organised every year by the J&K Govt. during the month of Shravan (July and August); the dates however, vary every year looking at the weather conditions and according to Purnima (Raksha Bandhan) in the month of Sharavan (Vikrama Samwat). This year Yatra will be taken up from 30 June, 2007 to 28 August, 2007. Yatra to Baba Amarnath Holy Cave for which one has to trek a height of about 14,500 ft is full of thrill and joy. The feeling of divine which is always beneath ones' heart, burst out and one realises 'Moksha' as one attends the Cave and perform the prayer before the Shivlinga. Surrounded by beautiful valleys, mountains, one will always feel His presence on the paradise of the earth, the memory of which hardly vanishes with time A journey which will rediscover the nature and its love which is always inside but one has never felt. The climatic conditions are very uncertain . Rain or snowfall may take place at any time or place during the Yatra. It is to be particularly noted that abrupt changes in temperature might occur. Sunny weather may turn into rain / snow fall in a short time. The temperature may fall up to -5 degree C.
Truly awesome post! It is really very interesting and informative. Keep more updates. In The Shoes Of Nehru Ji.